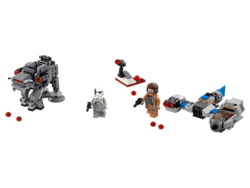 75195 Ski Speeder vs. First Order Walker Microfighters is a Star Wars set released in 2018. Pit First Order against Resistance in a micro planetside battle! 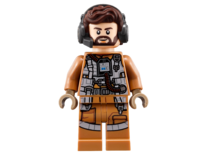 Enter the world of Star Wars: The Last Jedi with this LEGO® Microfighters dual pack. Featuring a Resistance Ski Speeder and First Order Heavy Assault Walker, each model includes stud shooters, lots of authentic detailing and space on top for a minifigure. 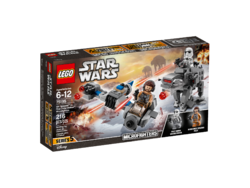 This LEGO Star Wars toy also includes a small trench build with stud shooter and extra ammo as an extra play starter, and with separate building instructions for each model, Star Wars fans will love building with friends and family. Includes 2 minifigures. 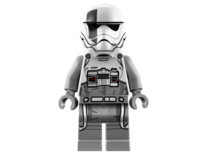 Facts about "75195 Ski Speeder vs. First Order Walker Microfighters"